As it turned out, the shoes were left in the gym and ended up in their lost-and-found section which I managed to retrieve 2 weeks later. 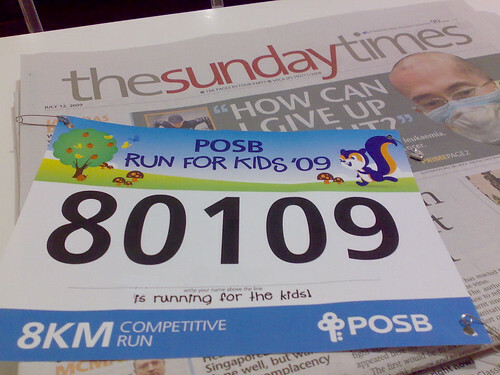 Fortunately, I was able to run in today's POSB Run For Kids 09. Yeah. I got my shoes though I almost couldn't find my number bib. Well almost. The morning turned out nice and cool with a light drizzle with the occasional flash of lightning. In all, the whole event was badly organised as no one seemed to be around to guide the arrivals of the runners. I guess most of us just did the logical thing and just walked over the the starting line which the flag off was a bit later. I started off slow as I don't see the need to have to jam myself with the eager pack. It's not like I am going to win this thing anyway. Not knowing the route as in run the route before certainly has its disadvantages as I have no idea how to pace myself. So I just agar agar try not to run too fast or risk running out of gas towards the end. At the 5km, I clocked at 27 min 42 secs on my watch. Not bad. A bit faster than I would have "budgeted". Then I started to struggle as I find myself unable to sustain the speed that I was running. Worse it did not help that I have to climb a flyover at the 6km mark. By the time, I hit the finishing line, I mistakenly thought I finished in 1 hour 01 min 02 secs. I was sorely disappointed as I did not expect my timing to be to off. I kept thinking about it throughout the day, scratching my head how the heck did I take more than 30 mins to clear the remaining 3 km? So by the time I got home after tennis (yeah, I went on to play tennis in the afternoon. I am so going to die tomorrow), I rechecked my watch only to see my timing to be 44 mins 42 secs. 8k's super impressive already, don't give yourself so much stress over the timing! Woot! Pro Jay! walk 44mins for 8km... become stronger though you are older now. msvindicta: I think my timing is decent and possibly not going to obsessed with improving it. Mistress Grace & Sunflower: To be honest, I have doubts over the accuracy of the timing. Shall find another 8km and do it all over again. Sure do another 8Km but hor, leave me out of it Heheheh Dun want to run with u.. Mistress Grace: Lai lah... mai shy wokay?